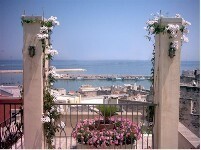 “Le terrazze” Bed & breakfast is settled in the old town centre of Bisceglie and overlooks the picturesque little seaport. The house dates back to the Middle Age and has been recently restored and renovated with very fine taste. The building on four levels and the excellent disposition of the living-space guarantee great comfort and absolute privacy. The rooms, all with bathroom, are furnished with antique, beautiful and functionalpiecesas well as the ample breakfast all. The wonderful terraces with a fine view over the sea, that gives the name to the bed & breakfast, is at disposal of the kind guests to witnesst he beauty of amazing summer sunsets along with the natural spectacle of “Tramontana” and the lively fire-works typical of patronal folk feasts.